It’s a miniature table that holds an LED lightbulb which provides a uniform spectrum of light through a pane of frosted glass. Artists can use lightboxes for drawing and tracing, sketch, animation, tattoo tracing, calligraphy, stenciling, embossing, embroidery designs, scrapbooking, quilting, X-Rays (for really weird art!!!) and even stained glass making. How to use a light box for sketching? 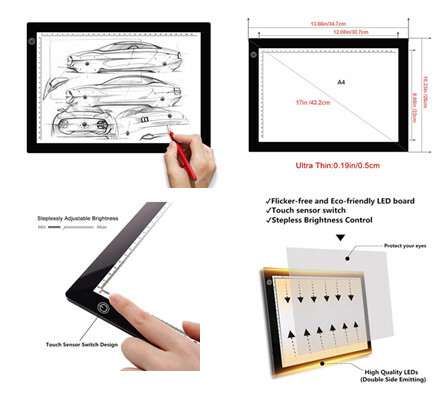 ✔ MULTIPLE USAGE: LED tracing light box can be widely used in Sketching & Drawing, 2D Animation, Architectural Design, Industrial Design, Sewing projects, Tattoo Transferring, X-ray Viewing, etc. With this utility light pad, everyone can be an artist, kids can enjoy their own artistic projects too. ✔ EYESIGHT-PROTECTED TECHNOLOGY: The Flicker-free and Eco-friendly LED board are healthy to your eyes, no shadow, no glare, and safe for long-time working. Compared to other products, the light of Light Pad is softer and more comfortable. ✔ ADJUSTABLE BRIGHTNESS TOUCH SENOR DESIGN: Touch sensor switch design and strapless brightness control, brightness dimming, turning on/off and control easily by slight touch. You can adjust the ideal brightness you want. ✔ USB POWERED: Come with a USB cable, and the cable is integrated with the mainboard, so it won't be disconnected while you are drawing. Easily powered on/off via USB cable by plugging into any USB port like a computer, power bank or USB Plug that connects directly to a wall outlet. Working Voltage: DC 5V, Rated Power: 5W. ✔ULTRA THIN & PORTABLE: L13.6” x W10.2” x H0.2”. The visual work area is 8.2" x 11.8”. The thickness is only 5mm, and it is lightweight(1.2lb) to carry and store in your traveling case. Bring it everywhere and be an artist anytime you like.